Happy Thanksgiving everyone! Today is the day I work on my year end recap for this site, so I won't be posting much today in terms of SEO banter. Instead, enjoy the day off, the family and the turkey - heck, even if you are not in America. Who doesn't love turkey? Google, Bing, and even Sogou have special Thanksgiving day logos and themes. Google has a turkey is an interesting one. Google wrote on their Doodle page that "though the pardoning of turkeys has been a presidential privilege since 1989, the Turkey in this Doodle has decided to pardon itself." Interesting, don't ya think? 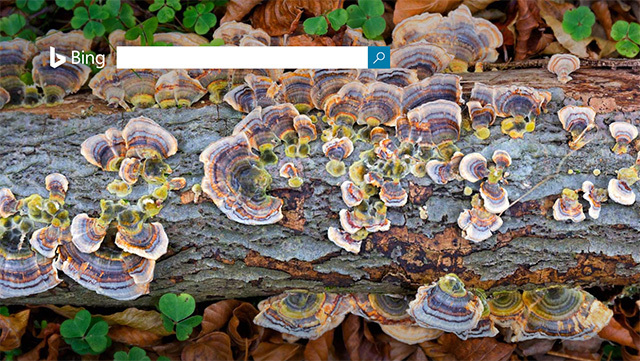 Here is the Bing theme which is the turkey tail fungus - Trametes versicolor, is fairly common around the world. And though it’s used in folk medicine teas and tinctures, it’s not something you’ll want to sauté up and serve alongside the sweet potatoes and cranberries today. Recent research indicates that a compound found in turkey tail fungus may help treat patients with various cancers. Way to go, turkey tail fungus! Here are the logos but for the past years Thanksgiving Day logos see 2016, 2015, 2014, 2013, 2012, 2011, 2010, 2009, 2008, 2007, 2006, 2005 and 2004 logos.